Although today is very patchy …. nice sunny spells, but broken by heavy rain squalls, thankfully quite short …. we have had some lovely days, with temps as high as 20 deg C.
And Iris has thoroughly enjoyed her garden time. Our spuds are well up, and now she has 7 rows in the upper garden. 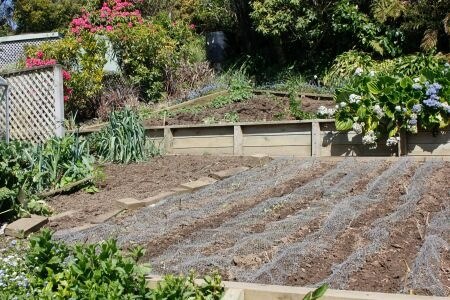 The lower garden has carrots, parsnips 3 types of onions, beetroot, 2 types of lettuce and lots of radishes. 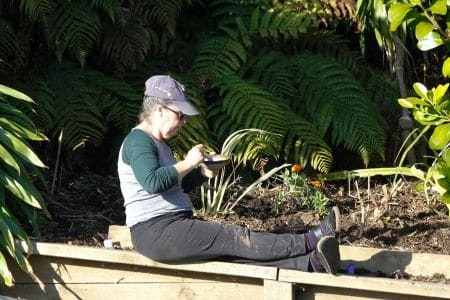 She mixes radish seeds with the others, and they come up so quickly they delineate the rows. And germination has been really quick, and the weather covers are long removed. Spottys hatchlings from last year. 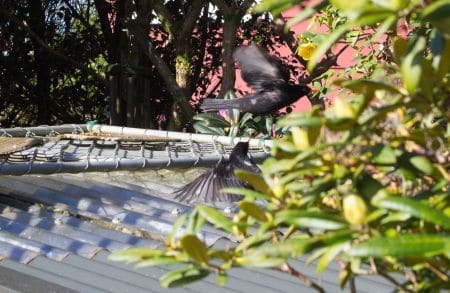 Now the problem is birds monstering the young plants. So the rows of seeds are covered with “tunnels” of bird netting. Quite a fiddly job, and after it was all done I had a head smack moment. We should have bought some of the bird netting the vineyards use for bird control. Easy to fit, as now both upper and lower vegetable gardens have heavy timber low boundary walls. Bit late now …. but next year !!. Even though we shout at them when they get into the garden many are old friends. 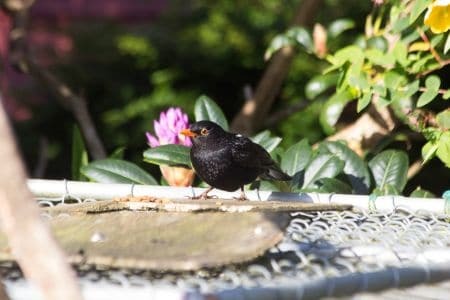 “Spotty” the male blackbird has been here several years. When we first saw his distinctive white spot on the back, we thought they were just a couple of damaged feathers. But no, they are there all the time, regrowing after each moult. So a genetic modification. 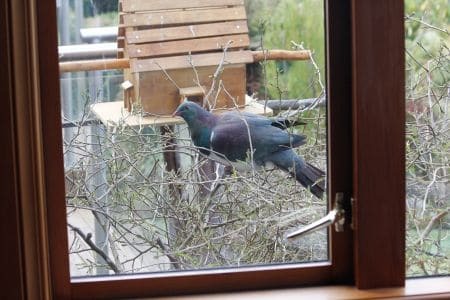 Native Pigeon lunching on Kowhai leaves outside our kitchen window.